Translated from the Spanish by Global Research. “There will be no solution to the electrical problem, there will be no water to the houses much less domestic gas”. the parliamentarian of Voluntad Popular stated verbatim. “We will generate the necessary internal pressure to add up in this process of definitive cessation of the usurpation,” he is heard saying in the video broadcast from the floor of the Federal Legislative Palace. “And I repeat, the cessation of darkness will definitely come with the cessation of usurpation,”culminated his TV intervention. Journalist Gustavo Villapol described Guaidó as a symbolic expression of the new political-military doctrine that Donald Trump is trying to develop from the presidency of the United States (USA). 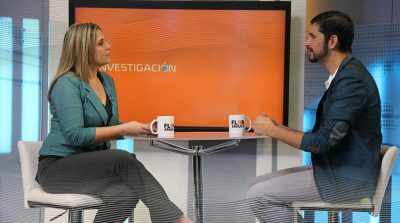 “A confesión de títere relevo de pruebas”, afirmó este miércoles el periodista Gustavo Villapol, al advertir que el diputado de la Asamblea Nacional en desacato Juan Guaidó confesó estar detrás de los atentados perpetrados contra el Servicio Eléctrico Nacional (SEN) que han afectado al pueblo venezolano desde el pasado 7 de marzo. 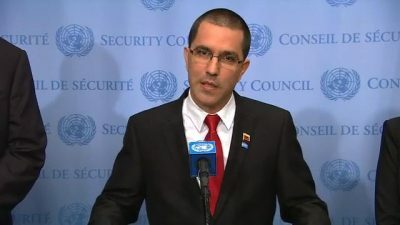 In a herculean effort to prevent war, and protect the integrity of his country, Venezuelan Foreign Minister Jorge Arreaza held a breathtaking schedule of events at the United Nations, including a meeting with the Secretary-General, consultations with the envoys of 60 member states supporting Venezuela’s sovereignty, a press conference the evening of February 22, speaking at a Security Council meeting February 26, and presenting an address at the UN Human Rights Council in Geneva on February 27. The main objective of the US-supported military coup in Chile was to impose the neoliberal economic agenda. “Regime change” was enforced through a covert military intelligence operation. Sweeping macro-economic reforms (including privatization, price liberalization and the freeze of wages) were implemented in early October 1973. Barely a few weeks after the military takeover, the military Junta headed by General Augusto Pinochet ordered a hike in the price of bread from 11 to 40 escudos, a hefty overnight increase of 264%. This “economic shock treatment” had been designed by a group of economists called the “Chicago Boys.” “While food prices had skyrocketed, wages had been frozen. From one day to the next, an entire country had been precipitated into abysmal poverty. In 1973, I was teaching economics at the Catholic University of Chile. I lived through two of the most brutal US sponsored military coups in Latin America’s history: Chile, September 11, 1973 and less than three years later, Argentina, March 24, 1976 under Operation Condor, which initiated Argentina’s Dirty War: “La Guerra Sucia”. And today, the Trump administration is threatening to invade Venezuela with a view to “restoring democracy”, replacing an elected president (casually described by the Western media as a “dictator”) by a US proxy, speaker of Venezuela’s National Assembly. 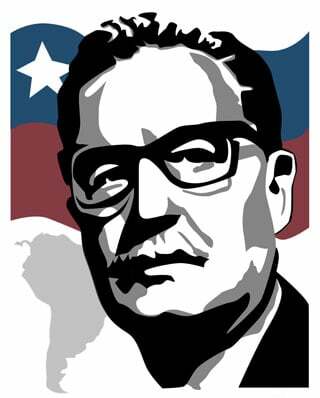 More than forty-five years ago on September 11, 1973, the Chilean military led by General Augusto Pinochet, crushed the democratically elected Unidad Popular government of Salvador Allende. Is Washington’s ongoing initiative directed against Venezuela modelled on Chile? A letter was sent today to the Science for Peace list-serve in response to the Science for Peace Statement on the Government of Canada’s ongoing campaign to overturn the elected government of Venezuela. Science for Peace is based in the Dept of Physics of the University of Toronto. What is most welcome in this statement is its expeditious issue and wide-lensed comprehension of the hypocritically self-serving role of Canada’s state, major mining corporations and banks in the plundering of Latin American societies and interference in their internal affairs to ensure that it can continue on and grow against elected governments seeking self-determination. (now for the first time our foreign minister mendaciously publicly leading the alliance of the externally orchestrated oppression, exploitation and coup in Venezuela). 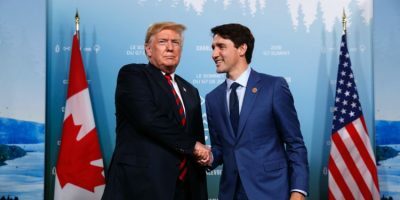 “Canada has, in recent years, supported the replacement of elected governments in Honduras, Guatemala, Haiti and now in Venezuela, and its relations with Latin America are problematical in broader terms. 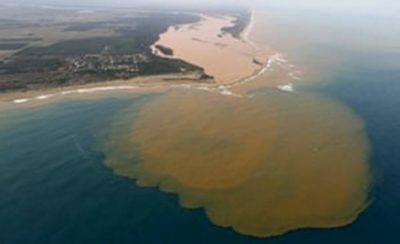 Canada provides a financial and legal haven for businesses that exploit labour and decimate the forests, agriculture, and watersheds in these countries. Canadian banks mire these countries in debt and buy up public utilities. I would like to add, however, that it is not only or primarily “the Trudeau government” that is “shaping its interventionist stance toward Venezuela”. It is, more specifically, Foreign Minister Freeland who also leads Canada and NATO towards massive militaristic operations on Russia’s borders, as well as warlike policies of the violent-coup established government of Ukraine with, as the right-wing states of Latin America, a chilling fondness for fascist military rule of the past. Chavez, either because he lacked the power to move against the traitorous Spanish elite or because he chose to display magnanimity, did not hold those responsible who participated in the coup against his life and Venezuelan sovereignty. Washington’s agents, the Spanish elite, were not arrested and retained their control over the media and the economy. Venezuela has substantial oil revenues, but they do not reach the government’s budget or protect the value of the currency. I do not know who controls the Venezuelan oil, but it appears the revenues are being stolen. Not surprising, Monsanto, today hidden behind the Bayer logo, as the world leader in patented GMO seeds and the probable carcinogenic Roundup herbicide with glyphosate, is attempting to quietly patent genetically modified or GMO varieties of fruits using controversial gene-editing. 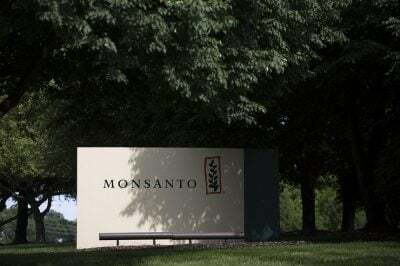 The “beauty” of this for Monsanto/Bayer is that in the USA, according to a recent ruling by the US Department of Agriculture, gene-edited agriculture needs no special independent testing. The developments are not good for human health or safety, nor will it do anything to give the world better nutrition. CRISPR gene-editing, a stealth attempt by the global agribusiness industry to promote artificial mutations of crops and, as the world was shocked recently to hear, even humans, as in China, is being advanced, much like GMO crops falsely were, as solution to world hunger. Globalisation is the demise of humanity. 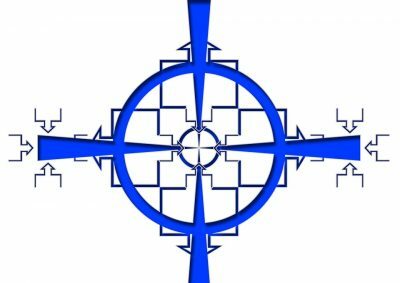 That being said, if we want peace, solidarity, harmonious cohabitation, justice and equality – we have to defeat globalisation. And to be able to defeat it, countries which strive to take back autonomy and sovereignty may want to move away from the oppressive fist of the west. BREXIT offers Europe and the world a formidable opportunity to break loose from the rigged, dollar-based fiat monetary system. 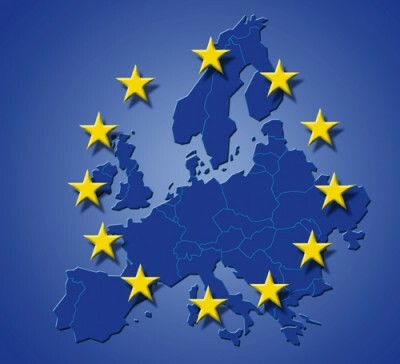 BREXIT opens the door for other European Union (EU) nations to do likewise. 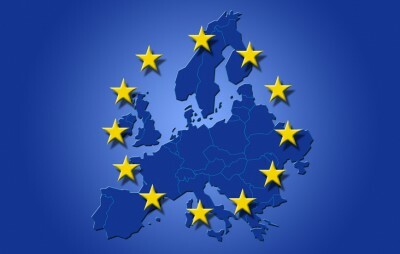 Different polls indicate that between 60% and 80% of all EU citizens are fed up with the corrupt EU, wanting to leave. In France, whose Mr. Hollande has reached the attribute of least popular President of all times and who is openly called a traitor of the people, a recent survey says more than 85% of the French are against the EU. Europeans are also worried about the gradual but steady integration of the EU with NATO. 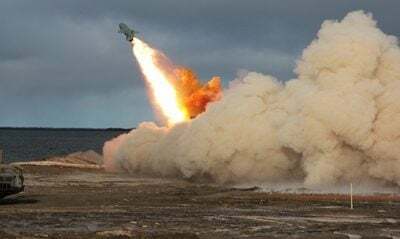 A militarisation of Europe with a US-led war machine moving ever closer towards Moscow is a strong and present danger for WWIII – meaning Europe may become again the theatre of war and destruction the third time in 100 years. Encircling China with two thirds of the US Navy fleet in the South China Sea, provoking territorial conflicts via the Philippines, a former colony and a US vassal; and presenting a constant menace with uncountable military bases in the area, all the way to Australia, are no signs of peaceful cooperation by Washington. Bringing down the EU would break up the Euro and may also break up NATO. This, of course, is non-coherent with Washington’s hold on power over Europe and aggression against Russia. 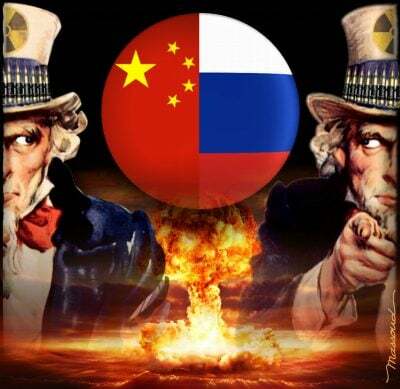 “The Rand Corporation, on contract with the US Army, which commissioned a report examining a war with China. Now, this is called “War With China: Thinking Through the Unthinkable.” The irony of this is that what they examined in this report is whether “we” could actually win a war on China. 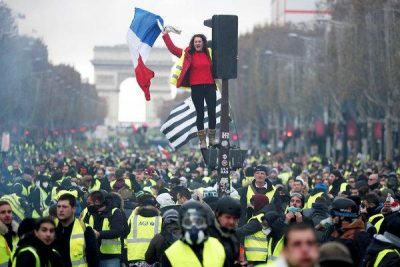 Will France, under Macron – Implosion 2 – become a candidate for exiting the EU thanks to the Yellow Vests? 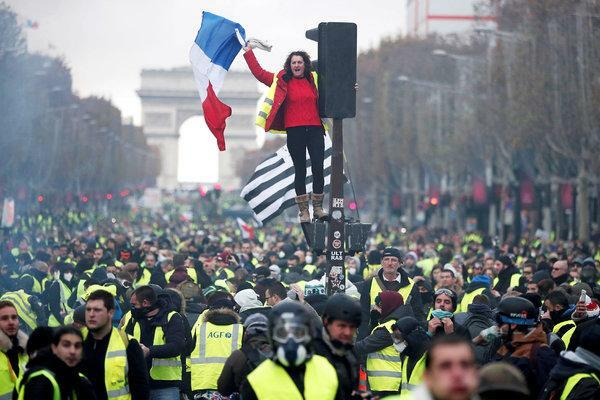 The “Gilets Jaunes” will not let go. Not even – or especially not – after Macron‘s half-hearted, rather cynical and grandstanding concessions – of “too little and too late” – which when analyzed constitute a new lie, especially regarding the increase of the minimum wage. It was clear from his face, these concessions, of a President who campaigned on the basis of “never make any concessions”, were fake, as fake as his fake attitude of an apologist could be. Even without listening to his words, his body language of arrogance gives him away. Chapeau to the French. Although their forefathers were among the most vicious and miserable exploiters, in human history – when they ravaged for hundreds of years West Africa – and the elite still does, unbeknown even to (most) of the Yellow Vets. Is there such a plane of blissful, balanced information, deliberated and debated upon? No. Governments mangle; corporations distort. Interest groups tinker. Wars must be sold; deception must be perpetrated. Inconsistencies must be removed. There will be success, measured in small doses; failure, dispatched in grand servings. The nature of news, hollow as it is, is to fill the next segment for the next release, a promiscuous delivery, an amoral ejaculate. The notion a complicated world can somehow be compressed into a press release, a brief, an observation, is sinister and defeating. The believers in an objective, balanced news platform are there. Grants are forked out for such romantic notions as news with integrity, directed to increase “trust in news”, which is tantamount to putting your trust in an institution which has been placed on the mortician’s table. The Trump era has seen a spike in such funding, but it belies a fundamental misconception about what news is. Funny, then, that the environment should now be so neatly split: the Russians (always) seen to distort from a central programme, while no one else does. The Kremlin manipulates feeble minds; virtuous powers do not. The most powerful nation on the planet claims to be free of this, the same country that boasts cable news networks and demagoguery on the airwaves that have a distinct allergy against anything resembling balanced reporting, many backed by vast funding mechanisms for political projects overseas. Britain, faded yet still nostalgically imperial, remains pure with the BBC, known as the Beeb, a sort of immaculate conception of news that purportedly survives manipulation. Other deliverers of news through state channels also worship the idol of balance – Australia’s ABC, for one, asserts that role. Last month Ritula Shah presented a BBC World Service discussion programme entitled Is “Fake News” A Threat To Democracy? Predictably the debate focused on Russian attempts to influence Western populations and political systems. “Read real journalism” — presumably BBC journalism — was one of the guest’s suggestions for countering Fake News. Putting this self-serving and self-congratulatory narrative to one side, it is worth considering the BBC’s, and particularly the BBC World Service’s, own relationship to the British government’s own propaganda. “Directly funded by government [the Foreign Office], rather than the licence fee” the World Service is “deeply embedded in the foreign policy, security and intelligence apparatus of the British state,” Dr Tom Mills notes in his must-read 2016 book The BBC: Myth of a Public Service. In particular, the BBC had a very close relationship to the Information Research Department (IRD) — “a Foreign Office propaganda outfit which sought especially to foster anti-communist sentiments on the left,” explains Mills, a Lecturer in Sociology and Policy at Aston University. Set up in 1948, the IRD “was one of the largest and best-funded sections of the Foreign Office until it was discreetly shut down in 1977 on the orders of [then foreign secretary] David Owen,” investigative journalist Ian Cobain reported in the Guardian in July 2018. The Doomsday Clock is likely to advance again later this January. What heralded the United States as a uniquely dangerous force was its creation of the atomic bomb, the world’s first nuclear weapon. Prompting this was Albert Einstein‘s signing of a letter regarding nuclear research, drafted by his fellow physicists Leo Szilard and Eugene Wigner, then quickly dispatched on 2 August 1939 to president Franklin D. Roosevelt. The letter detailed a formulation of “extremely powerful bombs of a new type” which “may thus be constructed”, and urged America to pursue the invention of such weapons before the Nazis. Fear of Hitler attaining atomic bombs was Einstein’s sole concern. Roosevelt responded on 19 October 1939 promising to “thoroughly investigate the possibilities of your suggestion”. Einstein himself, whose parents were Jewish, had much reason to be aggrieved with the Nazis. In March 1933, the 54-year-old Einstein was left severely shaken upon learning that men loyal to Hitler had raided his summer cottage in Caputh, a village just 30 miles from Berlin. His lakeside residence was then converted into a Hitler Youth camp. This was the due thanks afforded to Einstein after decades of glittering service to his country. Einstein, born in the southern German city of Ulm, quickly renounced his citizenship and spent periods in Belgium and England, before settling in America by the mid-1930s.